If you have been following the blog, you may have realized, Sunshine and I have recently returned from an adventure in Greece. It was a 7 day trip and we were concentrated out of Athens. 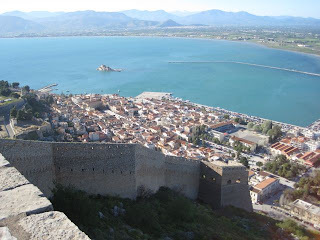 On the weekend, our hosts took us on a little road trip, about 2 hours from Athens, to the Port City of Nafplio. It is an old city in the Peloponnese area. Most of the old town is a peninsula jutting into the Argolic Gulf. This particular city seems to be a place where a lot of greeks go to take a relaxing get away. I think because of its easy access and inexpensive hotel rooms. We were able to get a room with a view of the inlet for 60 euros. The inlet has a fort/castle names the Bourtzi. This little island has a restaurant, however, it was closed while we were visiting. The area also has a castle on top of the hill called Palamidi. That fort/castle whatever was used as a prison as recently as 1800s. Because of its natural fortifications, and the location, it was a stronghold of the Ottoman Empire. The view from Palamidi of the old town is breathtaking. There are squares and shops to walk around and tour. Many Cafes for a stop of coffee and a bite to eat. Seafood is abundant in these eateries. Another great place stop if you ever find yourself in Greece, and a great get away from Athens.